McVeigh Parker run our own fleet of delivery vehicles to ensure a fast and efficient service. Please see below for details of our delivery service. If you're looking for an individual depots contact details please visit the depot locator page. Delivery costs start from as little as £5.99 but is dependent on the size and weight of your order. 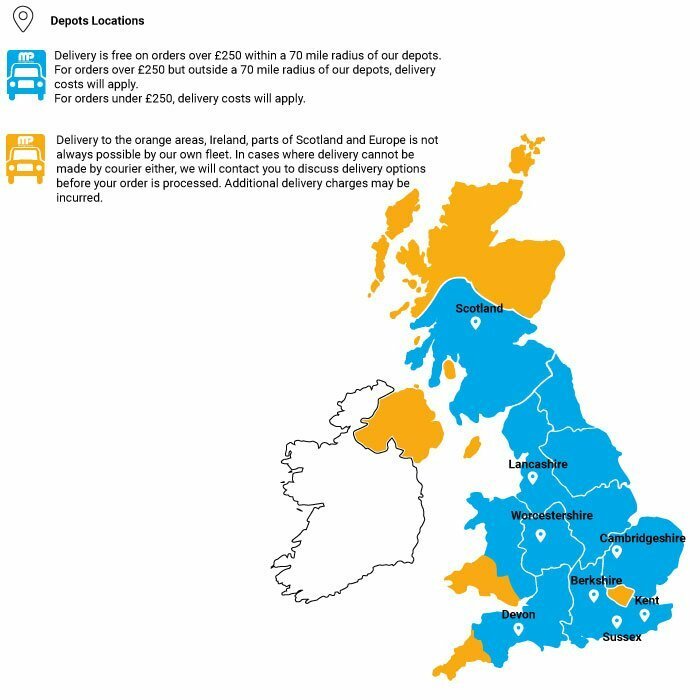 Once we receive your order, your local depot will contact you to advise delivery. Your items will either be delivered by our own experienced delivery fleet or by courier. Whilst our drivers and contractors will be as helpful as possible, they are instructed to curb side delivery only, or suitable truck side location if room. If over 25kg, mechanical or additional assistance is required by customer. Whilst every effort is made to meet your delivery date and time, we cannot guarantee this. Deliveries by our own vehicles will be done within our normal run times. You will be advised at the time of order approximate date and time. If you cannot accept our first delivery date this may delay your delivery. The majority of our vehicles are large HGV's with mechanical offload. Areas with restricted access to both trucks and personnel may incur an additional quote for delivery. Please advise at time of order if your location is difficult to get to. Any manual handling required by any of our staff and contractors is conditional on health and safety regulations, they cannot lift anything over 25kg. We pride ourselves on our massive stock holding, however by the nature of some products, longer lead times may apply. Should your order take longer than a week for delivery, we will let you know. Products susceptible to this will have it clearly marked on the product page.